The Lincoln Bedroom plays "Thrill Me, My Darling" (David Richman). It starts slow and then it rocks. They play on September 3 at Saloon Monday at The Gig (7302 Melrose Ave., Los Angeles 90046) and on September 19 at The Knitting Factory -- Alterknit Lounge (7021 Hollywood Blvd., Los Angeles 90028). Israelis survey damage after a rocket fired by Palestinians militants in Gaza landed in their house in the southern Israeli town of Sderot August 28, 2007. REUTERS/Amir Cohen. A Kassam rocket scored a direct hit on a home in Sderot on Tuesday shortly before Palestinian Authority Chairman Mahmoud Abbas and Prime Minister Ehud Olmert met in Jerusalem. One man sustained moderate shrapnel wounds to his eye and leg and several bystanders were treated for shock. The rocket hit the roof of the home over a bathroom shortly after it was vacated. Eli Sabag said the rocket narrowly missed his family. "I had just sat down to drink a cup of coffee when I heard the warning siren," he said. "My wife, my son and I went into the bomb shelter and waited for the Kassam to hit. When we opened the door, we saw a smoke mushroom, and we realized that it had fallen on our house." And who was responsible for an attack on Israeli civilians while Fatah’s Mahmoud Abbas went to meet Olmert? The Fatah-affiliated Al-Aksa Martyrs' Brigades, claimed responsibility for the attack, adding in its statement that the rocket was an Aksa-3, an improved model of the Kassam. In the meantime, Israeli citizens are sitting ducks. 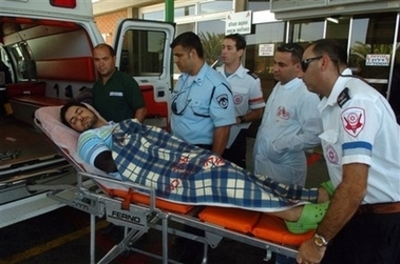 Israeli medics wheel a man, wounded by a homemade rocket fired by Palestinian militants in the town of Sderot, into hospital in the port city of Ashkelon, Israel, Tuesday Aug. 28, 2007. (AP Photo/Str). 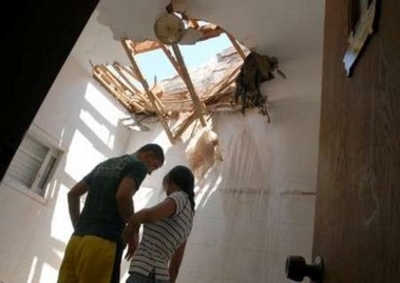 A Kassam rocket launched from the northern GazaStrip landed directly on the bedroom of a house in Sderot (28 August). The residents had heard the alarm and entered their secure room before the rocket struck. A passerby was moderately wounded in the eye by shrapnel, and several were treated for shock. A Kassam rocket fired from northern Gaza towards Israelhit a Sderot vehicle (25 August), destroying it completely. Eight Kassam rockets landed in Sderot and the Negevarea (23 August). One hit the Timsit family home in Sderot. Family members, who heard the Color Red alarm, were in the secure room when the rocket smashed through the living room's ceiling, and were not harmed. Two women were treated for anxiety. The Al-Quds Brigades, the Islamic Jihad's military wing, claimed responsibility. Palestinian terror groups launched a Kassam rocket from northern Gaza(21 August), which landed in a factory near the town of Sderot. No injuries were reported but damage was caused to the factory. Palestinians in north Gazafired two Kassams toward Israel(21 August). One rocket struck a vacant Na'amat daycare center in the western Negev city of Sderot, causing slight damage to the building. A woman living nearby suffered from shock as a result of the attack. The daycare center was empty during the August summer holiday. The second Kassam landed near a gas station outside the city. So in the last week alone: a direct hit on a home, complete destruction of a vehicle, another hit on a home, a hit on a factory, a hit on a daycare center, and a hit near a gas station. No retaliation. This is a “perfect storm” of an appeal. It combines international terrorism, free speech, the Internet, and something called “libel tourism.” . . .
A recent, mounting, and insidious trend, libel tourism occurs when a person, usually prominent and wealthy, sues for libel in a country that lacks the protections afforded by the First Amendment. Such suits smack of forum-shopping because the authors, the publisher, and the publications at issue have little, if any, connection to the country where the litigation is commenced. [Citations]. With the advent of the Internet and Internet commerce, including websites such as Amazon.com, it has become easier for foreign plaintiffs to allege that a publication written and distributed primarily in the United States was also “sold” or “published” in a foreign jurisdiction, even when the author and publisher took no actions to market or distribute the publication there.
. . . Saudis, like defendant, have taken particular advantage of this situation. “In a growing phenomenon that lawyers have dubbed ‘libel tourism,’ the Saudis are seeking to invoke Britain’s plaintiff-friendly libel laws to silence critics in the United States and in the international community.” [Citations].
. . . Plaintiff Dr. Rachel Ehrenfeld, a New York resident, wrote a book called Funding Evil: How Terrorism is Financed – and How to Stop It, which was published only in the United States. She seeks a judgment from federal court here in New York declaring an English libel default judgment against her totaling $221,000 unenforceable under the United States Constitution and New York Law. Defendant – Khalid Salim A Bin Mahfouz – sued Dr. Ehrenfeld for libel in England based on constitutionally protected statements in her book discussing his alleged financial support of terrorist organizations. He is not a citizen of England. He is a citizen of Saudi Arabia, and one of the wealthiest men in the world. Mahfouz won his UK libel judgment only by default. Dr. Ehrenfeld did not appear. She could not afford to defend herself in the English courts and was unwilling, as a matter of principle, to submit the libel issues to a legal system less protective of free speech than ours, when her book had nothing to do with England.
. . . Mahfouz, who has sued or threatened to sue for libel dozens of times in the UK, has waged a systematic campaign intended to suppress critics (in New York and elsewhere) and to discourage investigation of any role he may have had in the funding of terrorism that led to the 9/11 attacks. The scheme includes Mahfouz’ use of his website, accessible in New York, to announce to the world his “successes” in his UK libel cases, including the one against Dr. Ehrenfeld. To learn what a libel defendant must go through to mount a defense under the English libel laws, consult Deborah Lipstadt’s important book: “History on Trial: My Day in Court with David Irving.” Even with the best English lawyers, the support of a major American University, generous financial backing, and a lock-tight case against a Holocaust denier, it was an ordeal. Her “day” in court lasted five years. Dr. Ehrenfeld’s website is here. She could use some support. This case will be an important one involving an increasingly troublesome phenomenon. I think there has been a kind of movement within our State Department that was best reflected during the Clinton Administration – but you can see a little of this in Bush I, and it is still there in Bush II -- and it is to create a Palestinian state for the purpose of creating a Palestinian state, to say that we have achieved peace. Well, that could be extremely dangerous. We want to create, not necessarily a Palestinian state for the purpose of creating a Palestinian state -- we want to create a state that is now particularly going to help us in the Islamic terrorist war against us, not become another breeding ground for terrorism. . . . So if we are going to create a Palestinian state that assists us, and doesn’t become a terrorist state, here’s what they have to do: they have to first renounce terrorism. . . . Secondly, they have to recognize the right of Israel to exist as a Jewish state. If they do that, we can then begin a process of trying to create a Palestinian state. But we shouldn’t do it until we are sure that those two things are real, and we’re not getting fooled, because we’ve gotten fooled in the past.
. . . And I say a third thing is, they have to show that they can sustain that for at least some safe period of time, that it isn’t just a statement for the purpose of lulling people into a negotiation. Then we won’t give people false expectations of being able to achieve something. We won’t give the Israeli people false expectations; we won’t give the Palestinian people false expectations; we won’t give the rest of the world false expectations, when the United States will get blamed for why it’s not working. The reason we have not been able to create a Palestinian state to date is not because of lack of trying by the United States or Israel. It is because of the Palestinians. Clinton got Ehud Barak to agree to every single thing -- I think unwisely, actually -- that Arafat wanted, and Arafat walked away. The major problem of the Palestinian people is a corrupt, dishonest leadership. Arafat was a murderer and a thief . . .
You can’t negotiate with people like that. This isn’t a matter of being stubborn. . . . [T]here are people that are so dishonest, so dishonorable, that it is counter-productive to talk to them; it’s counter-productive to empower them. It just delays the ability to solve a problem. It’s like trying to buy a house from somebody who doesn’t own the house. What’s the point of doing it? Maybe you kind of satisfy yourself and others that you are talking to somebody, but you’re never going to buy the house, because the person doesn’t own the house. You keep offering him money for the house and he keeps agreeing, but then you don’t get the house. It's just stupid. The concept behind [the Roadmap] is that only security will lead to peace. And in that sequence. Without the achievement of full security within the framework of which terror organizations will be dismantled it will not be possible to achieve genuine peace, a peace for generations. This is the essence of the Roadmap. As it heads toward a November peace conference on final status issues, without having insisted on prior compliance with Phase I or II of its own Road Map, the Bush Administration is pushing expectations higher again, beyond what conditions on the ground will support. It could use a dose of Giuliani realism (not to speak of Yaalon realism). More on CNN's "God's Jewish Warriors"
There have been exactly 4 Jewish terrorist incidents or attempted incidents and you devoted half the program to them, discussing each one in detail. The people who support these are a fringe minority and roundly condemned by 98% of the settlement movement. People like Chanan Porat and myself are the representative, and yet you gave far more time to Yehuda Etzion and David HaIvri and the others who support this position. If you gave similar time to every single Arab terrorist attack, the show would go on for days if not years. . . .
Also, the legality of the settlements issue was so incredibly biased. Eugene Rostow, undersecretary of State wrote a seminal article defending their legality in the 80's, as did the Israeli Supreme Court -- yet not a mention was made of that perspective. . . . Why did you not quote a single legal or historical expert on the other side? Resolution 242, which as undersecretary of state for political affairs between 1966 and 1969 I helped produce, calls on the parties to make peace and allows Israel to administer the territories it occupied in 1967 until "a just and lasting peace in the Middle East" is achieved. When such a peace is made, Israel is required to withdraw its armed forces "from territories" it occupied during the Six-Day War -- not from "the" territories nor from "all" the territories, but from some of the territories . . . The British Mandate recognized the right of the Jewish people to "close settlement" in the whole of the Mandated territory. It was provided that local conditions might require Great Britain to "postpone" or "withhold" Jewish settlement in what is now Jordan. This was done in 1922. But the Jewish right of settlement in Palestine west of the Jordan river, that is, in Israel, the West Bank, Jerusalem, and the Gaza Strip, was made unassailable. That right has never been terminated and cannot be terminated except by a recognized peace between Israel and its neighbors. . . .
Sondra Oster Baras received a B.A. in History and English from Barnard College and a J.D. from Columbia University Law School. 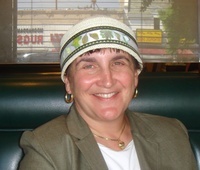 After briefly practicing law in New York, she moved to Israel in 1984 and joined a group of Orthodox Jews building Karnei Shomron in Samaria -- a community that now numbers 7,000 people. In 1998, she opened the Israel office of CFOIC and today she coordinates much of its community support programs world-wide. The Editorial Board has decided that what this blog needs is music. Laura Ingraham lists great music on her blog every day. Scott Johnson periodically posts erudite mini-essays on music. Charles Johnson used to post the album he was listening to as he blogged. Omri Ceren posts something to do with music (I think) every Wednesday. So the Board asked me to find something for JCI that would fit a specific niche: it had to be an engaging and talented new band; it had to have music informed by diverse influences -- say the Beatles and Hank Williams; it had to mix the rhythm and harmony of modern rock with the loneliness of country music; and it had to have a touch of poetry in the lyrics. Plus the band had to have a great name. It took a while, but here it is: The Lincoln Bedroom, performing “I Just Want to See Her Face Again.” Listen to it before you read the lyrics posted below. To fix her memory in my mind. If only I hadn't been so blind. But didn't know just what I had. Thinking what I did bad. I've been so blind, I couldn't see. I just want to see her face again. And if she's found somebody new. To do the things I couldn't do. And I was once a part of her. Thinking about how things were. The members of The Lincoln Bedroom are: Isaac Laskin, David Richman, Ben Woodlock, and Josh Zetumer. The complete list of influences includes: Whiskey, Southern gals, cowboy hats, down home cookin’, wrestling gators, Hank Williams, the Beatles. Tomorrow night, CNN will broadcast a two-hour show with Christiane Amanpour that CNN describes as the first part of a six-hour “television event”: “God’s Jewish Warriors” (to be following on successive nights by “God’s Muslim Warriors” and “God’s Christian Warriors”). This is the story of God’s Jewish Warriors, people who risk their lives – and their children's – to live in and claim what they believe is their religious birthright: East Jerusalem, with its holy Temple Mount, and the rocky hills of the West Bank, steeped in the history of patriarchs, prophets and biblical kings. When God’s Jewish Warriors used guerilla political tactics to build a settlers movement after the 1967 Six Day War, their goal was to incorporate the occupied West Bank and Gaza Strip into Israel. After 40 years, they have created situations that are difficult – maybe impossible – to change as long as religious fervor on both sides of the Palestinian-Israeli conflict stands in the way of territorial compromise. God’s Jewish Warriors believe they are commanded to live on this biblical land and that doing so will hasten the coming of the Messiah. At their most extreme, Jewish zealots are even willing to murder in God’s name to cripple land-for-peace negotiations. Meanwhile, the United States’ staunch support of Israel inflames much of the Muslim world and puts America in the crosshairs of jihad. Through this episode of God’s Warriors, we cut to the heart of the Israeli-Palestinian conflict, a knot tied so tightly by religious “fundamentalists” that it could strangle U.S. attempts to stabilize the explosive Middle East. The "heart of the Israeli-Palestinian conflict"? Since Arabs have rejected no less than four formal two-state solutions -- offered by the U.K. Peel Commission in 1937, the United Nations in 1947, Israel at Camp David in 2000, and the United States through the Clinton Parameters in 2000-01 -- and then responded to both the 2003 Roadmap and the 2005 Gaza withdrawal with increased terror, followed by the 2006 election of a terrorist-controlled government, it is a little disingenuous to blame the current situation on the settlers. The settlers were not there in 1937 and 1947; in the 2000-01 plans they would have been withdrawn almost completely; and they were in fact withdrawn completely from Gaza in 2005 with no effect other than the creation of Hamastan. Not only are the settlements not the problem; they are, as Hillel Halkin persuasively argued in 2002 in “Why the Settlements Should Stay,” part of the solution -- a test of Palestinian willingness to live with a Jewish minority in a new state protected with civil and political rights, in the same way an Arab minority lives in Israel. If such a state is unacceptable to the Palestinians, it can only be because they have a much higher priority than a state, which might explain the absence of peace in 1937, 1947, 2000, 2003 and 2005 -- and get a lot closer to the "heart" of the conflict. Rudy Giuliani’s Foreign Affairs essay -- with its emphasis on Palestinian political and security reform prior to Israeli-Palestinian negotiations (“Too much emphasis has been placed on brokering negotiations between the Israelis and the Palestinians -- negotiations that bring up the same issues again and again”) -- drew 1,704 comments at LGF. LGF called the essay “refreshingly realistic,” which caused me to go back and review an earlier occasion of refreshing realism -- Giuliani’s ejection of the uninvited Yasser Arafat from Lincoln Center on October 24, 1995. “Yasir Arafat, once Washington’s most reviled guerrilla leader, who came to the 1974 General Assembly with a holster on his hip and offered his audience the choice of an olive branch or a gun – and who, denied an American visa in 1988, caused the Assembly to decamp to Geneva to hear him out – recalled that history today as he appealed for help in creating an independent Palestinian state next to Israel. He was the only speaker to wear a military uniform. In a cordial session peppered even with occasional jokes, Yasir Arafat, chairman of the Palestine Liberation Organization, met with more than 100 prominent American Jews yesterday at the Bnai Zion building in midtown Manhattan. Mr. Arafat spoke briefly and then answered questions, emphasizing, like a season diplomat, the kinship between Palestinians and Jews. “Were not only cousins, we’re partners in peace,” he said. Some of those present warmed to him modestly. “He’s got a very good sense of humor, by the way,” said Israel Levine, a spokesman for many Jewish organizations. Mr. Arafat talked about compromise, and his desire to find a peaceful resolution of the differences between the Palestinians and Israel. He sought to allay the fears caused by his use of the word jihad; he said it should be interpreted not to mean holy war but, instead, effort, attempt or struggle. . . .
Last night at Lincoln Center, Mr. Arafat was again the center of attention. Many other luminaries, from Yitzak Rabin and Walter Cronkite to Mr. Zuckerman and Bianca Jagger, were among the 2,000 guests at the United Nations-sponsored performance of Beethoven’s ninth Symphony by the New York Philharmonic. But it was Mr. Arafat whom a swarm of autograph-seekers surrounded in the lobby of Avery Fisher Hall. Mayor Rudolph Giuliani, who evicted Yasir Arafat from a city-sponsored concert for United Nations dignitaries on Monday night, clearly lacks the diplomatic touch. Mr. Arafat showed up at Lincoln Center even though Mr. Giuliani had declared him unwelcome at city-sponsored events. The Mayor dispatched two aides to tell the P.L.O. leader to leave. Mr. Arafat may have intended to provoke a scene, but New York would have looked far nobler if Mr. Giuliani had displayed better manners than his unwanted guests. . . . The Mayor’s insult was especially ill timed, because the chairman of the Palestine Liberation Organization has, at some risk, become a key player in the American-sponsored Middle East peace process. The Mayor explained his action as a protest against past P.L.O. terrorism. Perhaps he thought he was reflecting the views of Jewish New Yorkers. Yet earlier in the day Mr. Arafat was the invited guest of prominent American Jewish leaders. He is the holder of a Nobel Peace Prize, a fact Mr. Giuliani dismissed yesterday. The Mayor argued that Mr. Arafat’s eviction would somehow make Middle East diplomacy “more realistic.” In fact, he has needlessly embarrassed the city at a moment when New York’s hospitality should be allowed to shine. A day after Mayor Rudolph W. Giuliani exprelled Yasir Arafat from a concert for world leaders at Lincoln Center, the Clinton Administration sharply criticized the Mayor yesterday for what Washington officials called an embarrassing breach of international diplomacy. Mr. Giuliani, clearly relishing the controversy, insisted that he could never forgive and play host to Mr. Arafat even though the Plaestinian leader has been embraced as a peacemaker by the Israeli and United States Governments. A spokesman for the United States Mission to the United Nations said the Administraiton made it clear to the city that Mr. Arafat, the chairman of the Palestine Liberation Organization, could be invited to local events. Mr. Clinton invited him to a White House reception on Sunday. . . . But the Mayor, explaining his decision yesterday, called Mr. Arafat a murderer and terrorist, and said he was not impressed by the fact that Mr. Arafat had twice been invited to the White House to sign the Middle East peace accords, or that he shared the Nobel Peace Prize. Mr. Giuliani said his antipathy toward Mr. Arafat – like his antipathy toward the Cuban leader Fidel Castro – went back to his days as a Federal prosecutor. As United States Attorney, he investigated several terrorist incidents to which the P.L.O. was linked, including the hijacking in 1985 of the Achille Lauro cruise ship. As far as he was concerned, the Mayor said, the statute of limitations on those incidents has not run out. . . . The Mayor said yesterday that when he was told that Mr. Arafat had entered the concert hall, he told his chief of staff, Randy Mastro, to ask him to leave. [The Mayor] told Israelis on Sunday to be more cautious in their dealings with Yasir Arafat, the Palestinian leader. By tacitly criticizing the policies of Prime Minister Shimon Peres, Mr. Giuliani came close to meddling in the Israeli election campaign. Even as the May was speaking, Mr. Peres was claiming some initial success in his campaign to get Mr. Arafat to crack down hard on the Islamic terrorist groups. . . . The Mayor’s clumsiness does not come entirely as a surprise. Last fall he rudely evicted Mr. Arafat from a Lincoln Center concert during the United Nations 50th anniversary commemoration . . .
LGF may have coined a new foreign policy category. There are realists, and then there are refreshing realists. It takes that kind of fanaticism to believe that the correct response . . . during the current "peace process" is to redouble the effort . . . And yet accelerating the peace process is exactly what a chorus of Western voices is advocating. . . .
[Hamas] is one of two leading political movements in Palestinian society. Is it a majority? Perhaps, but even if not, so what? . . . [T]hey certainly represent a moral majority, enjoying the silent approbation of large sections of Palestinian society. . . . There is a substantial, determined part of the Palestinian people, a part with much popular support and no significant moral opposition, that utterly rejects any peace, any compromise, anything that leaves standing a Jewish state. To ignore such a message is folly. It is even greater folly to counter that message by increasing Israel's vulnerability with a grotesquely named "peace process" . . . . [Gaza is] now a terrorist preserve that Israel does not control, cannot even enter. It is Beirut brought home. To answer this security catastrophe by creating more Gazas in the West Bank, even closer now to Tel Aviv and Jerusalem and Haifa, is the very definition of fanaticism. The article was written in 1995. Five years later, the Palestinian Authority was twice offered a state, on substantially all of the West Bank and Gaza, with a capital in Jerusalem -- once at Camp David in July 2000 and again with the Clinton Parameters in December 2000 -- and twice the PA rejected it, in favor of a new war. In 2003, having lost that war, the Palestinian Authority was offered still another opportunity for a state, and formally agreed to a plan under which final status issues would be addressed if -- but only if -- the PA first conducted sustained and visible efforts to dismantle the Palestinian terrorist infrastructure. In 2004, the U.S. formally promised Israel it would not support any other plan. In 2005, Israel dismantled all 21 settlements in Gaza (plus four others in the West Bank as an indication that further withdrawals would occur) and turned Gaza over to the Palestinians to enable them to demonstrate their ability to live “side by side in peace and security.” In 2006, the Palestinians elected Hamas to run their government, who then used Gaza to send rockets into Israel, build tunnels underneath it, kill and kidnap Israeli soldiers, and import massive quantities of new weapons in preparation for another war. So now, in 2007, with not a single terrorist organization dismantled, with the premier one elected to run the Palestinian government, with Gaza completely in their hands, with the areas on Israel’s Southern and Northern borders armed to the teeth, and with the West Bank secure only because of the presence of the IDF, the U.S. has decided to redouble efforts to pressure Israel to commence final status negotiations on the basis of a Saudi Plan calling for a complete withdrawal and a right of return. The Palestinian people need decent governance first, as a prerequisite for statehood. Too much emphasis has been placed on brokering negotiations between the Israelis and the Palestinians -- negotiations that bring up the same issues again and again. It is not in the interest of the United States, at a time when it is being threatened by Islamist terrorists, to assist the creation of another state that will support terrorism. Palestinian statehood will have to be earned through sustained good governance, a clear commitment to fighting terrorism, and a willingness to live in peace with Israel. Yesterday, one did. The full text is here. When meeting with her in Jerusalem, I asked [Olmert’s] spokesperson, Miri Eisen, what her response would be to those who say that unilaterally making concessions is a well-known sign of weakness to Israel’s opponents, and, like in Lebanon and Gaza, would serve only to embolden the fighters to strike harder. While some argue that Israel could be helping by removing more checkpoints and releasing more prisoners, what Dichter says of such "experiments" is sobering: "It's impossible to jump from the Shalom Tower without a parachute every time and say: 'Wow, we crashed.'" The physics of the peace process.